When it comes to cost-effective and convenient waste disposal, it is hard overlook the number of cheap skip hire options available. Skip hire is not only affordable, but it also promotes high levels of recycling, with many skip providers achieving recycling rates of more than 85%. In this guide, we will highlight some tips to ensure you receive the cheapest possible skip prices. There is also some advice to avoid picking a bad skip provider, and we make it easy to find a great deal from trusted and local skip firms. Before we jump in, you may be interested in understanding the skip sizes available (and how to pick the right size for your waste) and how much skip hire costs. If you are new to skips, these helpful guides may be worth a read. Now, on to the tips for cheap skip hire. Do you need a cheap skip? Fill in the form below to compare prices and find the cheapest skip deals near you. It only takes a moment, and there is absolutely no obligation to proceed, and no cost to use this service. Hiring a skip can be one of the most convenient and cheapest waste removal options available. But there are a few ways that you can save even more on your skip hire. Our team of money saving experts love helping consumers save more on services, such as skip hire. Below are a few of our best tips to ensure you receive a cheap skip hire deal. Whilst you may be lucky enough to find a great last minute deal, you have the best chance of receiving a better deal if you book in advance. There are a number of costs that regularly rise, such as skip permits and landfill prices, so book early to avoid price increases. Skip firms will also have more availability if you book in advance, so it is less likely you will have to pay a premium price if hiring during a peak time. It is one of the most widely suggested tips across our site, and the reason is simple – it works! Comparing prices is easy and will only take a few moments, so you really have nothing to lose. More often than not, you will find a cheaper deal, and who doesn’t like saving money! We make it easy to compare prices – simply fill in one form, and we will do the hard work to bring you the best deals from trusted and local skip providers. To avoid paying more than you need to, it is important that you choose the right skip for your waste. If you pick as skip that is too large, you will pay more than you need to. However, if you choose a skip that is too small, you will be left with unwanted waste, and may have to pay more to dispose of it. To help you choose the right skip for your needs, we have put together a nifty skip size guide. It may seem odd that skip hire has seasonal fluctuations, but they do. Most skips are hired during the warmer months, when residential clients want to undertake a home improvement task, such as a renovation or garden clean up. To find the cheapest skip prices, consider hiring your skip during winter, when skip providers are more willing to give a better deal to secure your business. It may seem obvious, but simply asking for a better deal can result in a discount. It only takes a moment to ask if the supplier can provide a better price, and the worst case scenario is a “no, sorry”. This tip is more effective at smaller firms, who are happy to accept a small discount in their pricing to have you book their skip bins. 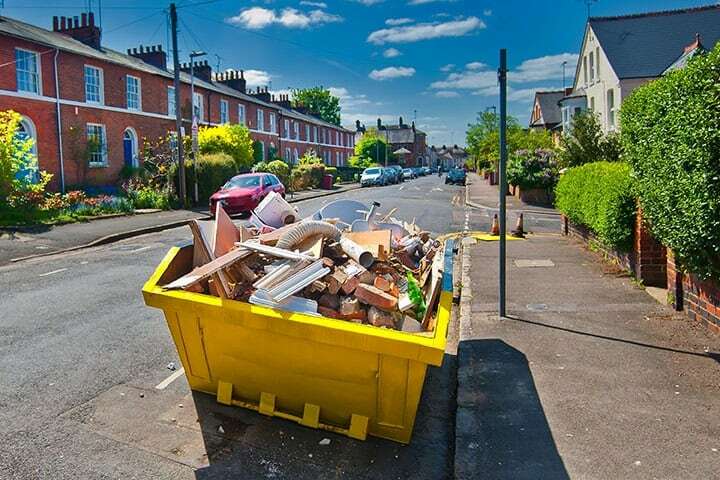 If you have less waste, you will require a small skip, and a smaller skip will cost less. If you have items that are still working or may be of interest to others (such as bricks or building materials), you may be able to sell them on sites like Gumtree or give them away on Freecycle. Don’t clog up your skip with waste that others will take away for free (or even pay you for). Council permits can almost double the cost of smaller skips in some locations around the UK. As such, it is always a good idea to try and avoid the need for a council permit if you are looking to for cheap skip hire prices. If you are able to place the skip on your property or nearby private property (with the owners permission), you will not require a permit. Unfortunately, in some cases permits are unavoidable. In these cases, it is recommended that you ensure the skip is ready for collection within your allocated permit time, as you will need to pay additional costs to extend your permit if you overrun. Skips are not the only waste removal option available, and in some cases they aren’t the cheapest option. Some popular skip hire alternatives include skip bags (which start from as little as £14), wait & load skips and waste removal teams. Waste removal teams, such as Clearabee, are often a great option if your waste is ready to be taken away and you don’t want to do the heavy lifting. It is important to understand what can be put in a skip before hiring. There are quite a few items that are prohibited from skips, and these items will need to be disposed of separately. If you do place restricted items into a skip, you may have to pay a fine or additional costs to pay for the correct disposal or recycling. We strongly suggest that you check with your skip provider about what is allowed in a skip, as each provider may have their own rules. For a great skip hire deal, request a quote today! The team at Assistall are amongst the best money saving expert’s in the country – we love helping consumers save! But we can always use a hand, so if you know of any other tips or tricks for hiring a cheap skip that we have missed, please let us know! If a skip hire deal seems too good to be true, it might be. Over recent years, there have been unfortunate cases of skip providers not following the rules and even illegally fly tipping skip waste. This is a serious concern, as the waste can often be traced back to the original owner, who may then be liable for costs and damages. We always recommend that you check that your skip provider holds a valid waste carriers licence.